← Develop a work and life mantra. Run a lemonade stand with your kids and teach them basic business skills. So I realize it is the first week of fall and you may not be thinking about running a lemonade stand (apple cider stand – anyone? ), but there are definitely lessons to be learned from the lemonade stand experience I want to share with you. Over the last few summers, my kids and some of their friends were pleading with me to do a lemonade stand. “Can we PLEASE do a lemonade stand this year?” is a question I would constantly hear as the end of the school year was approaching. This was the summer I was determined to make it happen. I saw it as a good learning opportunity as well as being a lot of fun. There are lots of business skills children can learn from running a lemonade stand: project planning, goal setting, marketing, customer service, math, cross functional training and fundraising. We are always looking for ways to give back to the community and decided to donate all the proceeds from our lemonade stand to the Smile Train. This organization provides free cleft repair surgeries to those in need while helping to train local doctors. How did we do it? What supplies to we need? Country Time lemonade mix, pitchers for lemonade, cups, napkins, ice, easel for sign, table, etc. What time of day should we run our lemonade stand? Who will run the lemonade stand? My two daughters, me and which friends can help us? I sent out an email in the morning the day of our lemonade stand to friends, family, classmates to create awareness. Great practice for adding, subtracting, giving the correct change. Good customer service does matter. No one wants to buy lemonade from a grumpy kid. Smiling, welcoming and thanking your customers for supporting your lemonade stand will help drive your lemonade stand sales. I have to say the kids loved running their lemonade stand and I enjoyed the experience as much as they did. 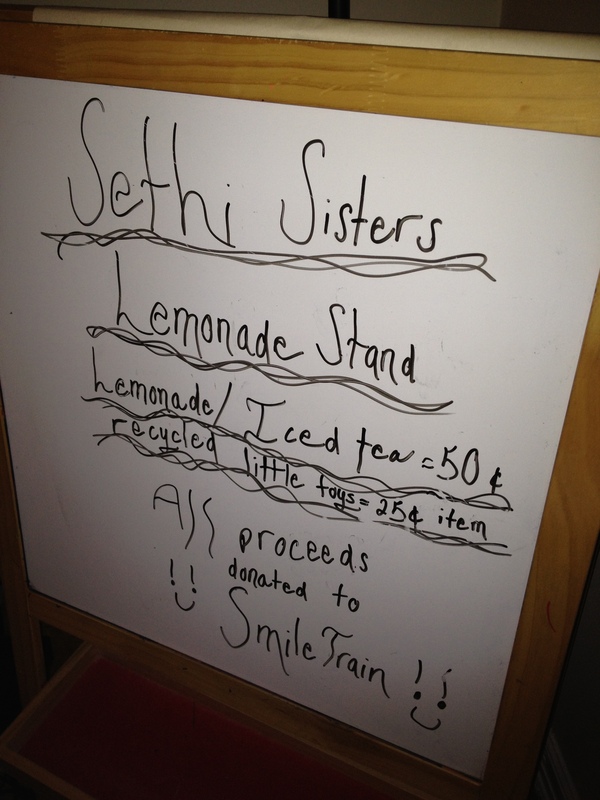 Our goal was to raise $250 for one cleft surgery for the Smile Train – we ran three lemonade stands over the course of the summer and achieved this goal! Our efforts have made it possible for a child born with cleft to eat, breathe, speak properly, and smile. What a wonderful feeling – Who knew a lemonade stand could teach so many valuable lessons?